I love beef jerky! I started trying to make my own within the past year or so, but never quite stumbled upon a recipe that I really loved until now. Store bought stuff is just okay, and well, often times it’s just too sweet. Sweet meat just seems weird to me, unless you’re eating Chinese food, and then it’s to be expected in certain dishes, I suppose. 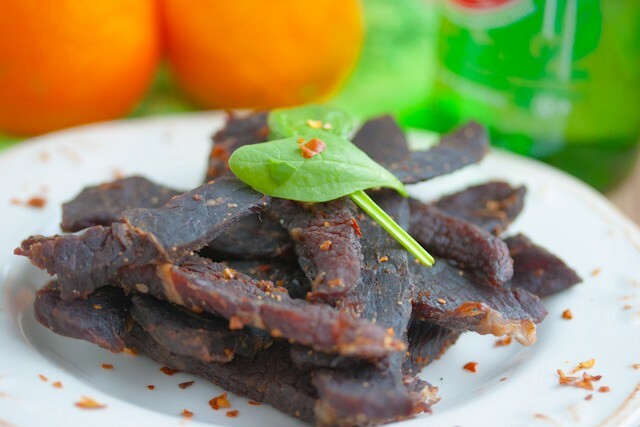 But I’ve often eaten commercial/store-bought beef jerky and it almost seems more like candied dry beef – kinda gross, I think. This recipe has a touch a sweetness, a touch of smokiness, and a touch of heat. The flavors all mesh together in an amazing way and it comes together so easily. I also love this recipe because you can control each of the flavors, by reducing or increasing the flavors that you like most. I use an inexpensive dehydrator that I picked up with a coupon at my local Bed, Bath, and Beyond store. Alton Brown describes how to dry the beef out with a box fan…however, if you don’t have a dehydrator, I’m thinking it might be easier to just set your oven on the lowest possible temp and crack the door oven a bit to achieve a temp that would be at least in the ballpark. 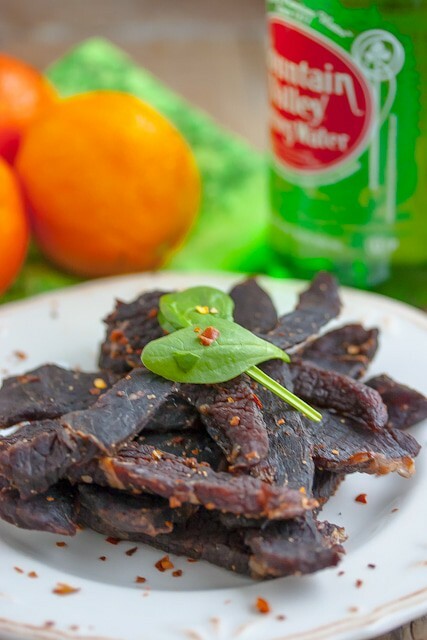 A delicious homemade beef jerky with sweet, spicy, and smoky undertones. Amazingly good!! In a small bowl, combine all marinade ingredients and mix well. In a large bowl or ziplock bag, combine meat with marinade, distributing the marinade well to ensure all the meat is coated. To help with slicing the meat thin, consider slightly freezing your meat. Check the meat after 2 hours, 4 hours, and then every 1/2 hour thereafter the first time you make this jerky. I’m about to try making this. Have you learned anymore tips in the last couple years? I have made this exact recipe before. Love it. Thanks. 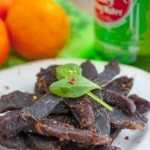 I have a bunch of recipes as well as a weekly podcast about making jerky available on itunes that i think you will love. Keep up the good work.